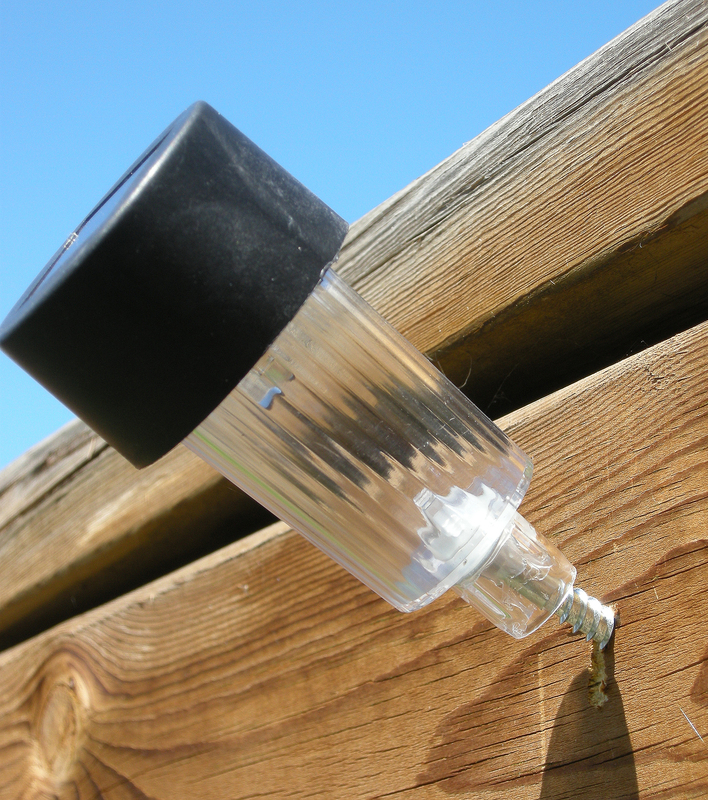 Solar Garden Light Hack — Dollar Store style! We have a simple back yard at the beginning of its evolution. We inherited a deck a rough shed, a patch of grass, and that’s about it. I am many things, but at the top of the list is ‘cheap’. I hate paying for electricity when I don’t have to. I wanted to string lights in the yard but was damned if I’d pay the bill to feed them as well as have to buy an expensive outdoor timer. Also, there was nothing in the middle of the yard to support a string. The crude solution? Use the old fence itself. This is where the Dollarama dollar-and-more store came to the rescue. They sell a few types of solar yard lights, from $1.25 to $3.00. For this project I went with the cheapies. I started with five, to see whether the concept would work. These little lights are simple—not much more than a tiny solar panel on top, a rechargeable battery, and an LED in a clear tube on top of a shaft and spike, to plant in the garden. My idea was to remove the spike, and attach the lamp itself to our fence. We have harsh winds here so I decided to go with heavy-duty screws. Since I don’t believe in interfering with the neighbour’s enjoyment of their own yard, the lights had to be below the top of our 6′ fence. I needed the solar panels to be exposed to as much sunlight as possible, but I also needed the lamps to be mostly vertical so that rain and snow would pool inside and short them out. The screw, predrilled into the fence, below the top. 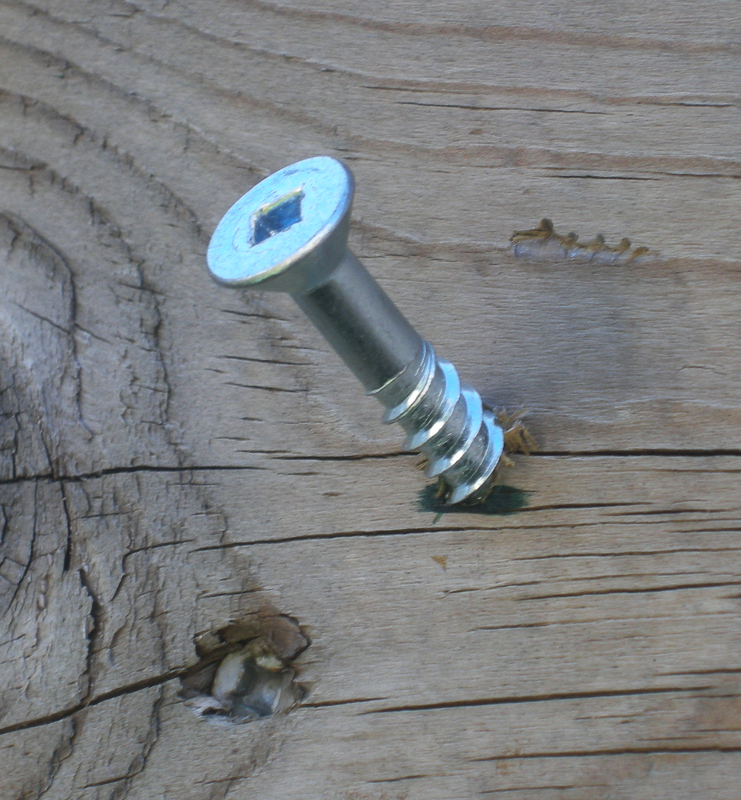 Here’s one of the screws in the fence. On about a 50-degree angle, 4″ down from the top. Being 1/4″ thick, I pre-drilled it to make sure it didn’t split the old, dry board. The cracks you see were already there. The next step was to squirt hot glue into the base of the lamp and quickly slide it and seat it onto the screw. Dollar Store improvised solar fence light. Nice and simple. The black cap unscrews and there is an On-Off toggle switch inside. Remember to switch it on. I turned them all on before attaching them so that I didn’t risk breaking the glue seal. The other reason for the angle is so that snow will slide off in winter. Here is the first row of lights… yes, the first screw isn’t on the same angle. If my limited OCD can’t handle it, I’ll fix it. In the meantime, it’s just fine. A simple, solid solution in a row. 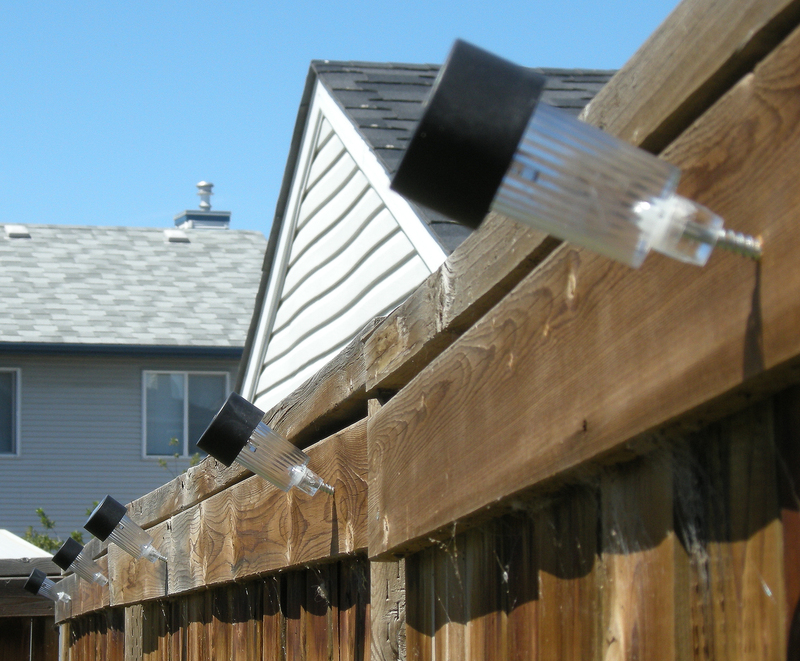 Solar garden lights screwed to the fence. So, how does it all look? Well, this photo doesn’t do it justice, but now there’s a nice line of lights defining our yard. It’s just a start. The final installation is 17 lights on the fence, 53″ apart. I had to make sure that the ones near the gate were out of the gate’s reach, too. The total cost, including a glue gun, glue sticks, screws, and sales tax, was just under $30. As soon as I put the winding pathway in, there will be five fancier lights to illuminate it, at $3 each. The total installation took less than fifteen minutes. The best part is, there is no hit on our utility bill. Cheap can work. Once I add a pergola to the yard or deck, there will be more lights to come, but hopefully in a colourful string, to add some oomph to the space. The Brilliant Banner for Writers…if I say so myself.